Join Barry as he breaks in to a secret laboratory to commandeer the experimental jetpacks from the clutches of science evildoers. Suit up with a selection of the coolest jetpacks ever made and take to the skies as Barry Steakfries, the lovable hero on a one-way trip to adventure! From the creators of the worldwide phenomenon Fruit Ninja comes the action-packed Jetpack Joyride. 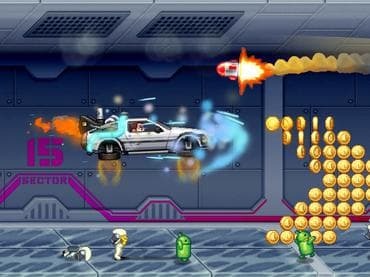 You'll start off with the legendary Machine Gun Jetpack to scatter the evil scientists, but throughout each game you'll collect coins and complete missions to earn cash and buy new gear in The Stash! Pick your favorite jetpack, snazzy outfit and stock up on items then get back out there for more action! If you have questions about Jetpack Joyride game, please contact us using this form.